Situated in Colden Square from 1896, the statue of Governor George Clinton was relocated in 1989, to where he stands now, in Clinton Square. The original statue was created by sculptor H. K. Brown and stands in in Washington D.C, the copy that was erected in Newburg was recast the sculptor’s nephew, H. K. Bush-Brown. At the corner of Fullerton Ave. and Third Street, Clinton Square marks the entrance to the Colonial Terraces district. In the center is a statue of General and Governor George Clinton. Originally in Colden Square, the statue of Clinton was dedicated on October 6, 1896. A copy of the statue by local sculptor Henry K. Brown that stands in the Capitol in Washington, it was cast in bronze by his nephew, H. K. Bush-Brown. According to Ruttenber in 1881, “it may with truth be said of George Clinton that he was to the State of New York what Washington was to the nation.” He served as Brigadier General in the Continental Army, and was the first New York State Governor in 1777. Early in the summer of 1917, Chatterton rented a small office on the second floor of the Highland Bank building in downtown Newburgh. It was cramped and hot, but by sticking his head out of the window he had a good bird’s-eye view in three directions. 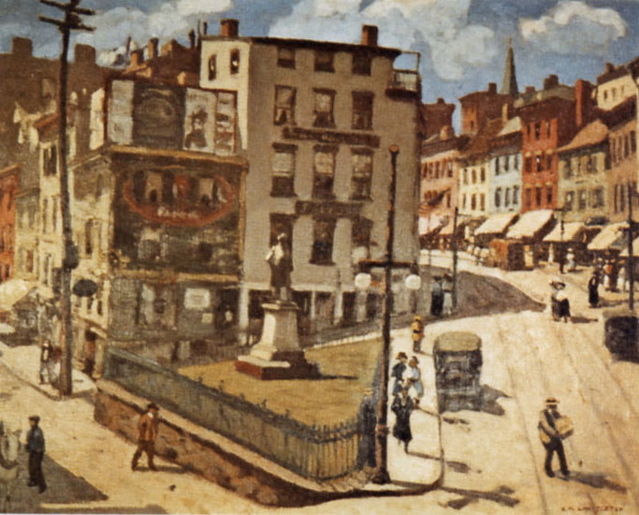 He spent the whole summer painting there and the three views became three large oil paintings — Water Street, Saturday Shopping, and Clinton Square. Wildenstein had three galleries: two large ones connected by a small one. Chatterton’s show was held in the small gallery, between a Toulouse Lautrec exhibition in one of the large galleries and a Fragonard show in the other. Evidently Chatterton’s work, mostly paintings of his Newburgh period, did not suffer in the invitable comparison as critical comment was quite favorable. A highlight of the 1909 celebrations was a regatta in the Newburgh Bay with fifty ships of all sizes and descriptions, including replicas of Hudson’s Half Moon and Fulton’s Claremont. Judging from the postcard below, they were joined by blimps, balloons, and the Wright Brothers’ Flyer (the first flight was in 1903), although the this last appearance is otherwise undocumented! People watching the bathers and the boating on the banks of the Lake. Published by Ruben's, Newburgh, N. Y. ENTRANCE TO ORANGE LAKE PARK, NEWBURGH, N. Y.
Unloading and loading platform at Orange Lake Park. Published by J. Ruben, 39 Johnston St., Newburgh, N. Y. In this as in every winter since 1881. the Newburgh-Beacon Ferry has kept up regular service. No other Ferry on the Hudson operates during the severe winters. It would be more profitable if the ferry suspended operations during the season of heavy ice, but that would entail discomfort and exposure to its patrons if they had to cross the ice during the gales, storms, and zero temperature of the winter months, and besides, we have pardonable pride in our record, and intend to live up to it. 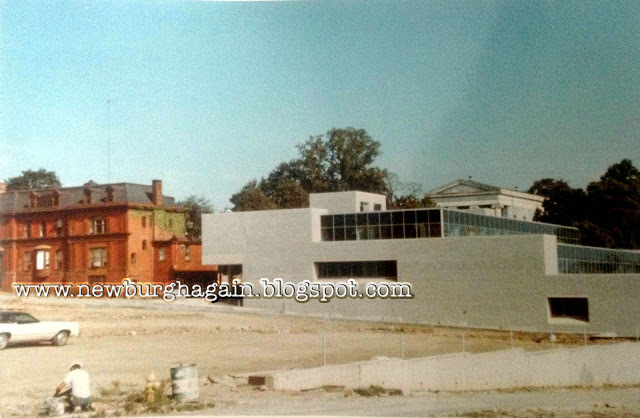 Even at the time these photos were taken (1976), the Newburgh City Club, aka the Culbert House, has been a topic of discussion, as to wheher it should be restored or demolished. NEWBURGH, one of the most beautifully-located cities in America, starts on the last quarter of its first century of existence as a city with new confidence and, promise of accumulating development. The community has passed through, 10 years of the most devastating depression in history without suffering any reverse which it has not been able to overcome. It has more than held its own; and among business men and citizens there is unwavering belief in the city’s future and firm resolve to continue, consolidate and intensify the progress which has been recorded since 1865. Located on mile-wide Newburgh Bay at the gateway to Hudson Highlands, with a background of mountains to the east, south and southwest, Newburgh has an artistic charm which sets it apart from other communities and justifies the vision of Hendrick Hudson, discoverer of the Hudson River, in 1609 regarding the pleasantness of the location on which “to build a city”. 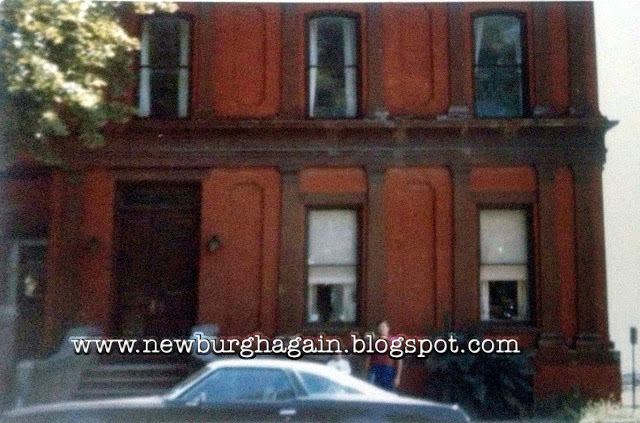 The 75th anniversary of the chartering of Newburgh as a city by Act of the Legislature is also the 140th anniversary of its incorporation as a village, Newburgh was the third village established in the State. 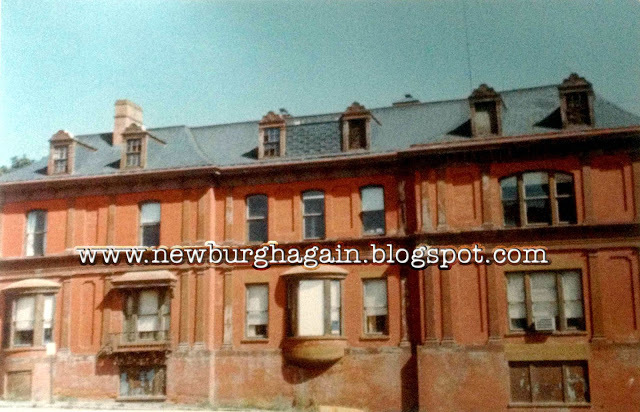 Through all the years, from colonization by German Lutheran refugees in 1709, through township and village days to the present city government, Newburgh has made a distinctive name for itself in history, industry and commerce, in cultural accomplishments, education, religion and recreation, and in other lines which have given the community character and enriched life, and have contributed generally to the public welfare. 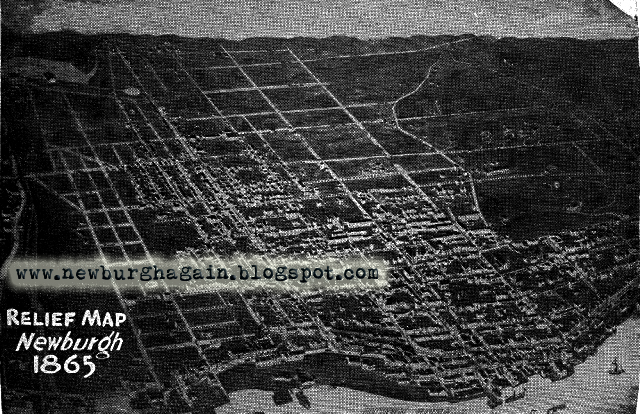 Beginning as a village with about 2,500 population, and as a city with about 16,000, Newburgh has now approximately 32,000 residents, not including large suburban populations to the north, west and south. 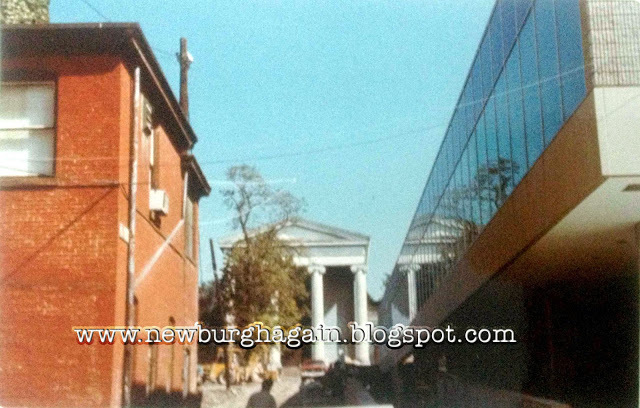 Unlike most cities, Newburgh has made little change in boundaries in 75 years. Few cities of comparable population have such restricted area. The city ranks 18th in the State and 301st in the United States. 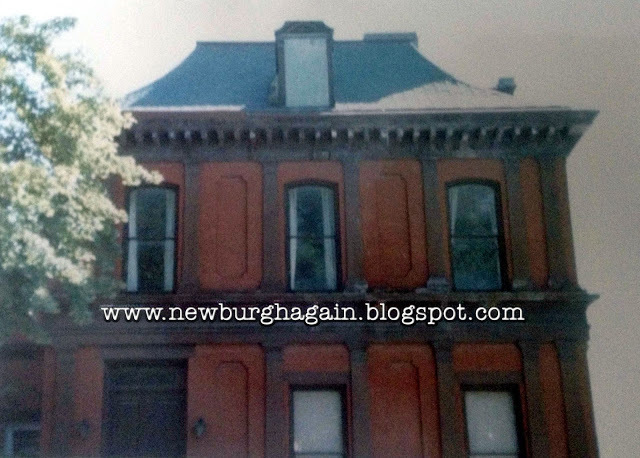 To a far greater extent than the average city, Newburgh’s welfare has been affected by transportation, in which tremendous changes have taken place in 150 years. At the outset, Newburgh was the outlet from a vast “western country” extending as far as Buffalo to the New York City market. Those were the days when the only transport was by wagon and water. Newburgh’s location on the Hudson was the most favorable of any town, because of ease of access through mountains to the west and northwest. Construction of railroads diverted much of the trade, and Newburgh suffered until its business men united in the building of turnpikes. 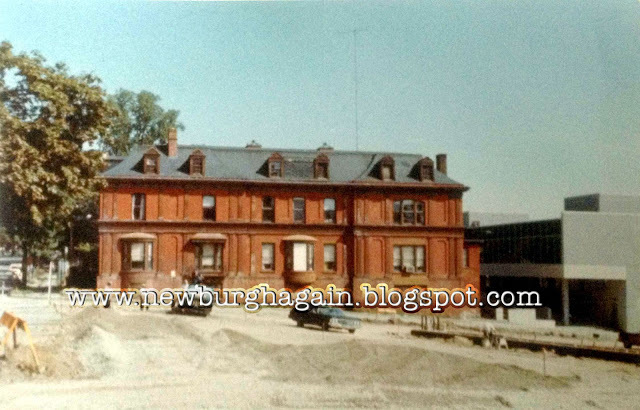 Subsequently Newburgh also obtained railroad facilities and retrieved much of its oldtime position. But further changes in transport were due to take place. For many years there was high level of activity on railroads and the Hudson River, and Newburgh enjoyed prosperity greater than that experienced in earlier days. Gradually, however, a new factor in transportation developed – the modern highway and the self- propelled vehicle. This is the factor which predominates today and gives every promise of continuing for all time. Newburgh, following inevitable readjustments in its industry and commerce, is reaching a stabilization with regard to transport which definitely fixes the business trend of the community and appears to make certain development and growth in excess of anything experienced before. Within late years Newburgh has become the chief distributing center of the mid-Hudson region. This is a fact because of its combined facilities of railway, waterway and most of all highway. The city is a base for operations extending for many miles in all directions west of the Hudson. Several national concerns have established distributing stations in the city and vicinity, and others are certain to do so. Meanwhile there have been manufacturing changes, with a trend from “heavy” to “light” industries. While some of the changes have been seemingly advantageous, the net effect, over a period of time, has been consolidation of gains from new concerns which have taken up the slack in employment. Current surveys indicate steady improvement, with the number of gainfully employed exceeding the national average. One block to the left from boat landing. Nearest place to get dinner. Electric Cars to Washington’s Headquarters pass the Door. The handsome lawns of the Orange County Court House on the front, and of the American Reformed Church on the North, afford a pleasant outlook, while its rear rooms and piazza command an unobstructed view of river and mountains for twenty miles. Only five blocks from Steamboat Landing, Ferry and Union Passenger Station. Free bus from all boats and trains. Elevator, Private Baths, Telegraph Office. Rates, $3.00 to $4.00 per Day. Newburgh passengers will have time to dine at The Palatine, visit Washington’s Headquarters and return on south-bound boat. H. N. BAIN & Co., Proprietors. 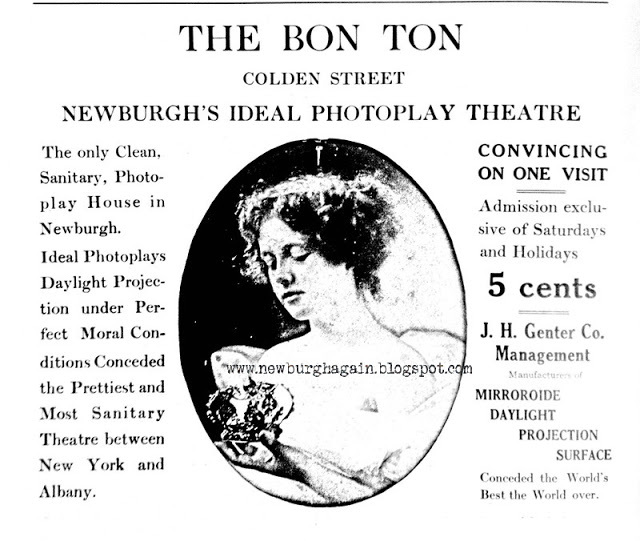 The only Clean, Sanitary, Photoplay House in Newburgh. Ideal Photoplays Daylight Projection under Perfect Moral Conditions Conceded the Prettiest and Most Sanitary Theatre between New York and Albany. Conceded the World’s Best the World over.